The United States District Court for the Southern District of New York (in case citations, S.D.N.Y. ), known informally as The Mother Court, is a federal district court. Appeals from the Southern District of New York are taken to the United States Court of Appeals for the Second Circuit (except for patent claims and claims against the U.S. government under the Tucker Act, which are appealed to the Federal Circuit). The Southern District is one of the most influential and active federal district courts in the United States, largely because of its jurisdiction over New York's major financial centers. 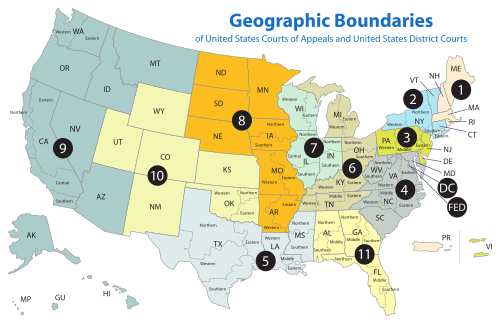 The Court's jurisdiction comprises the following counties: New York (Manhattan), Bronx, Westchester, Putnam, Rockland, Orange, Dutchess, and Sullivan. The United States Attorney's Office for the Southern District of New York represents the United States in civil and criminal litigation in the court. The current United States Attorney is Geoffrey Berman since January 5, 2018. The court sits in the Thurgood Marshall United States Courthouse and Daniel Patrick Moynihan United States Courthouse, both in Manhattan, and in the Charles L. Brieant Federal Building and Courthouse in White Plains. The United States District Court for the District of New York was one of the original 13 courts established by the Judiciary Act of 1789, 1 Stat. 73, on September 24, 1789. It first sat at the old Merchants Exchange on Broad Street in November 1789, the first federal court to do so. The Act of April 9, 1814, 3 Stat. 120, divided the District of New York into Northern and Southern Districts. The subdivision of the district was reportedly instigated by Matthias Burnett Tallmadge, out of antipathy for fellow district judge William P. Van Ness. These Districts were later further subdivided with the creation of Eastern District on February 25, 1865 by 13 Stat. 438, and the Western District on May 12, 1900, by 31 Stat. 175. For the first hundred years of its existence, the case load of the District was dominated first by admiralty cases, and then by a mix of admiralty and bankruptcy cases. The primary responsibility for hearing bankruptcy cases has since been transferred to the United States Bankruptcy Court for the Southern District of New York, with the District Court only reviewing cases already decided by a bankruptcy judge. Since its creation, the Southern District of New York has had 149 judges, more than any other District. Twenty judges from the Southern District of New York have been elevated to the United States Court of Appeals for the Second Circuit—Samuel Blatchford, Charles Merrill Hough, Learned Hand, Julius Marshuetz Mayer, Augustus Noble Hand, Martin Thomas Manton, Robert P. Patterson, Harold Medina, Irving Kaufman, Wilfred Feinberg, Walter R. Mansfield, Murray Gurfein, Lawrence W. Pierce, Pierre N. Leval, John M. Walker Jr., Sonia Sotomayor, Denny Chin, Barrington Daniels Parker Jr., Gerard E. Lynch, and Richard J. Sullivan. Two judges, Samuel Blatchford and Sonia Sotomayor, were elevated from the Southern District of New York to serve as Circuit Judge for the Second Circuit and were later elevated to the Supreme Court of the United States. The longest serving judge, David Norton Edelstein, served as an active judge for 43 years to the day, and in senior status for an additional six years. Judges of the court have gone on to other high governmental positions. Robert P. Patterson Sr. served as Under Secretary of War under President Franklin Roosevelt and the Secretary of War under President Harry S. Truman. Louis Freeh served as Director of the Federal Bureau of Investigation from September 1993 to June 2001. Michael Mukasey served as the 81st United States Attorney General under President George W. Bush. The injury and loss of life claims from the sinking of the Titanic, the torpedo attack on the Lusitania and the fire aboard the General Slocum were heard in the S.D.N.Y. The espionage trial of Julius and Ethel Rosenberg and the perjury trial of Alger Hiss were heard in the S.D.N.Y. Judge John M. Woolsey of the S.D.N.Y. rejected government efforts to censor on obscenity grounds the distribution of James Joyce's Ulysses. Judge Murray Gurfein of the Court rejected government efforts to enjoin the New York Times from publishing the Pentagon Papers. Defamation suits were heard in the S.D.N.Y. against CBS and Time Magazine by General William Westmoreland and Israeli General Ariel Sharon. Two former Attorneys General of the United States were indicted and tried in the S.D.N.Y. for crimes while in office – Harry Daugherty of the Teapot Dome era and John Mitchell of the Watergate era. Juries were unable to reach verdicts in the two trials against Daugherty; John Mitchell was acquitted. Financial frauds have been prosecuted in the S.D.N.Y., among them the cases against Bernard Madoff, Ivan Boesky, and Michael Milken. Bombings: the trials of those accused of the 1998 United States embassy bombings in East Africa; those alleged to have been responsible for the 1993 World Trade Center bombing; and Omar Abdel Rahman (known in the press as "The Blind Sheikh"), occurred in the District. More recently, the prosecution arising out of the 2010 Times Square car bombing attempt were each heard in the S.D.N.Y. Bridgeman v. Corel (1999) established that exact reproductions of public domain paintings were not subject to copyright protection. Prosecution of Abduwali Muse, the so-called "Somali Pirate", was heard in the Court. The criminal cases against Bess Myerson, Leona Helmsley and Martha Stewart were heard in the S.D.N.Y., as was the U.S. case against Imelda Marcos. The Deflategate controversy concerning National Football League's Tom Brady was heard in the S.D.N.Y. Hosseinzadeh v. Klein, concerning the practice of fair use in online video content, was heard in the S.D.N.Y. On December 12, 2018, William H. Pauley III sentenced Michael Cohen– who had served as personal legal counsel to U.S. president Donald Trump for more than a decade –to "three years in prison and millions in forfeitures, restitution and fines", after pleading guilty to charges including campaign finance violations, tax evasion and committing perjury while under oath before Congress. ^ Judge Haight has sat with the District of Connecticut since taking senior status. 3 Samuel Blatchford NY 1820–1893 1867–1878 — — A. Johnson appointment to 2d Cir. 8 Charles Merrill Hough NY 1858–1927 1906–1916 — — T. Roosevelt appointment to 2d Cir. 9 Learned Hand NY 1872–1961 1909–1924 — — Taft appointment to 2d Cir. 10 Julius Marshuetz Mayer NY 1865–1925 1912–1921 — — Taft appointment to 2d Cir. 11 Augustus Noble Hand NY 1869–1954 1914–1927 — — Wilson appointment to 2d Cir. 12 Martin Thomas Manton NY 1880–1946 1916–1918 — — Wilson appointment to 2d Cir. 22 Robert P. Patterson NY 1891–1952 1930–1939 — — Hoover appointment to 2d Cir. 30 Harold Medina NY 1888–1990 1947–1951 — — Truman appointment to 2d Cir. 33 Irving Kaufman NY 1910–1992 1949–1961 — — Truman appointment to 2d Cir. 54 Wilfred Feinberg NY 1920–2014 1961–1966 — — Kennedy appointment to 2d Cir. 61 Walter R. Mansfield NY 1911–1987 1966–1971 — — L. Johnson appointment to 2d Cir. 65 Murray Gurfein NY 1907–1979 1971–1974 — — Nixon appointment to 2d Cir. 66 Lawrence W. Pierce NY 1924–present 1971–1981 — — Nixon appointment to 2d Cir. 82 Pierre N. Leval NY 1936–present 1977–1993 — — Carter appointment to 2d Cir. 92 John M. Walker Jr. NY 1940–present 1985–1989 — — Reagan appointment to 2d Cir. 103 Sonia Sotomayor NY 1954–present 1992–1998 — — G.H.W. Bush appointment to 2d Cir. 107 Denny Chin NY 1954–present 1994–2010 — — Clinton appointment to 2d Cir. 111 Barrington Daniels Parker Jr. NY 1944–present 1994–2001 — — Clinton appointment to 2d Cir. 124 Gerard E. Lynch NY 1951–present 2000–2009 — — Clinton appointment to 2d Cir. 131 Richard J. Sullivan NY 1964–present 2007–2018 — — G.W. Bush appointment to 2d Cir. Seat became permanent upon the abolition of Seat 7 on December 31, 1943. ^ "The Mother Court: A.K.A., the Southern District Court of New York". www.americanbar.org. Retrieved October 14, 2018. ^ "Southern District of New York 225th Anniversary". history.nysd.uscourts.gov. Retrieved December 14, 2018. ^ a b Asbury Dickens, A Synoptical Index to the Laws and Treaties of the United States of America (1852), p. 386. ^ a b c d U.S. District Courts of New York, Legislative history, Federal Judicial Center. ^ a b H. Paul Burak, History of the United States District Court for the Southern District of New York (1962). ^ Forrest, Katherine (August 23, 2017). "Matt Hosseinzadeh, Plaintiff, v. Ethan Klein and Hila Klein, Defendants". United States District Court, S.D. New York (cv-3081). Retrieved December 12, 2017. ^ Hamilton, Colby "Cohen's 'Blind Loyalty' Leads to 3-Year Prison Term", New York Law Journal via Law.com, December 12, 2018. Retrieved December 12, 2018. ^ "Ex-Trump lawyer Cohen jailed for 36 months". BBC News. December 12, 2018. Retrieved December 12, 2018. ^ Initially appointed to the United States District Court for the District of New York, reassigned by operation of law to the Southern District of New York on April 9, 1814. ^ Recess appointment; formally nominated on July 13, 1867, confirmed by the United States Senate on July 16, 1867, and received commission on July 16, 1867. ^ Recess appointment; formally nominated on October 12, 1881, confirmed by the United States Senate on October 14, 1881, and received commission on October 14, 1881. ^ Recess appointment; formally nominated on December 6, 1927, confirmed by the United States Senate on December 19, 1927, and received commission on December 19, 1927. ^ Recess appointment; formally nominated on November 24, 1947, confirmed by the United States Senate on December 18, 1947, and received commission on December 20, 1947. ^ Recess appointment; formally nominated on January 13, 1949, confirmed by the United States Senate on January 31, 1949, and received commission on February 2, 1949. ^ Recess appointment; formally nominated on January 5, 1950, confirmed by the United States Senate on April 25, 1950, and received commission on April 26, 1950. ^ Recess appointment; formally nominated on January 5, 1950, confirmed by the United States Senate on April 28, 1950, and received commission on May 1, 1950. ^ Recess appointment; formally nominated on January 30, 1952, confirmed by the United States Senate on April 7, 1952, and received commission on April 8, 1952. ^ Recess appointment; formally nominated on January 12, 1956, confirmed by the United States Senate on June 26, 1956, and received commission on June 27, 1956. ^ Recess appointment; formally nominated on January 12, 1956, confirmed by the United States Senate on March 1, 1956, and received commission on March 2, 1956. ^ a b Recess appointment; formally nominated on January 15, 1962, confirmed by the United States Senate on March 16, 1962, and received commission on March 17, 1962. ^ Recess appointment; formally nominated on January 15, 1962, confirmed by the United States Senate on September 20, 1962, and received commission on September 28, 1962. ^ Tenney was nominated for a seat on the S.D.N.Y. by President Kennedy, but he was confirmed after Kennedy's assassination and was appointed to the Court by (i.e., received his commission from) President Johnson. This page was last edited on 11 April 2019, at 03:44 (UTC).